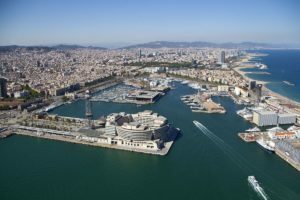 The Spanish port of Barcelona has reported its 2017 results which appear indeed amazing: +26% growth to the previous year. Due to this tremendous gain Barcelona has become the fastest-growing European port. The port’s total traffic reached 61.4 mln tonnes, thus surpassing the mark of 61 mln for the first time. Container handling, one of the strategic segments of the port’s activity, significantly contributed to this exceptional result. In 2017, Barcelona handled 2,968,757 TEU, recording a year-on-year increase of 32.3%. Largely this was achieved due to a 2.4 times surge in transhipment traffic: 1,068,292 TEU against 451,151 TEU last year. Obviously, the dockworkers strikes, that were causing disruptions in major Spanish ports of Algeciras and Valencia and shipping lines’ vessel diversions during the past spring, did not affect much the operations of Barcelona. On the contrary, these unfortunate events have brought additional – transhipment – volumes into it. Observing the monthly evolution of the port’s container traffic, we see a consistent growth of 14.5% to 58.6% month by month. Only in April 2017 the rise was a mere 5.4%. Foreign trade volumes also performed well. Imports grew 8.3% (561,103 TEU) and export cargo was up 2.6% (705,204 TEU). The Catalonian movement towards sovereignty has not produced any apparent impact on Barcelona’s container volumes so far. It can only be noted that following the October referendum, after which Catalonia declared its independence, import volumes stagnated and exports decreased by 4.6% that month. And although November saw a double-digit rise – +14.6% in imports and +18.6% in exports – December brought a new slump of -14.7% in full exports and flat imports (+0.3%). The beginning year will show whether it was just a seasonal fluctuation or a longer-term tendency of reaction to the regional political uncertainty. As to other cargo types, liquid bulk also hit a record in 2017 by growing 27%, to 14.4 mln tonnes, mainly due to handling hydrocarbons. Dry bulk showed just a slight increase of around 1% (4.4 mln tonnes). Ro-ro traffic marked a rise of 6.2% (393,601 intermodal transport units). The volume of vehicles handled by Barcelona dropped by 8.7% (837,273 vehicles), which is explained by the fact that Spanish vehicle production and exports overall declined last year. Still, Barcelona remains the leading Spanish port in terms of car shipment. 2017 marked the first year in the port’s history, when its passenger traffic exceeded 4 mln people. This includes ferry passengers (1.4 mln) and cruise-goers (2.7 mln). The total rise of 4.5% was mostly caused by ferry users (+11.8%), whereas cruise travelers increased just by 1%. Interestingly, in the months considered as the “low” season (January, February, March, November and December) cruise passenger numbers were up 13%, while in the remaining months there was a decrease of 2%.